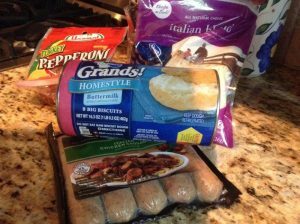 Thanks to Pillsbury Grands and CleverGirls for sponsoring this post on Back to School Easy Dinner Ideas of this easy pizza casserole. Now that the kids are in school and the kids activities are in full swing, getting dinner on the table can be a challenge. I wish I was better at meal planning but I often find myself looking in the fridge for dinner ideas around the time the bus is due to drop off the kids. Having a stash of quick go to Back to school Easy dinner ideas is always a winner. Thanks to the folks at Pillsbury, they have created an easy dinner ideas Recipe Booklet that you can download and print if you wish. You can find these easy dinner ideas HERE. Most of these recipes include Pillsbury Grands. You know the biscuit product in the tubes in the refrigerated sections of your grocery store? I have made mini pizzas and pot pie with the Pillsbury Grands before but did not realize all the other possibilities. You definitely want to keep some of these in your fridge when you are looking for easy dinner ideas. I was most intrigued by the recipe for Grands! 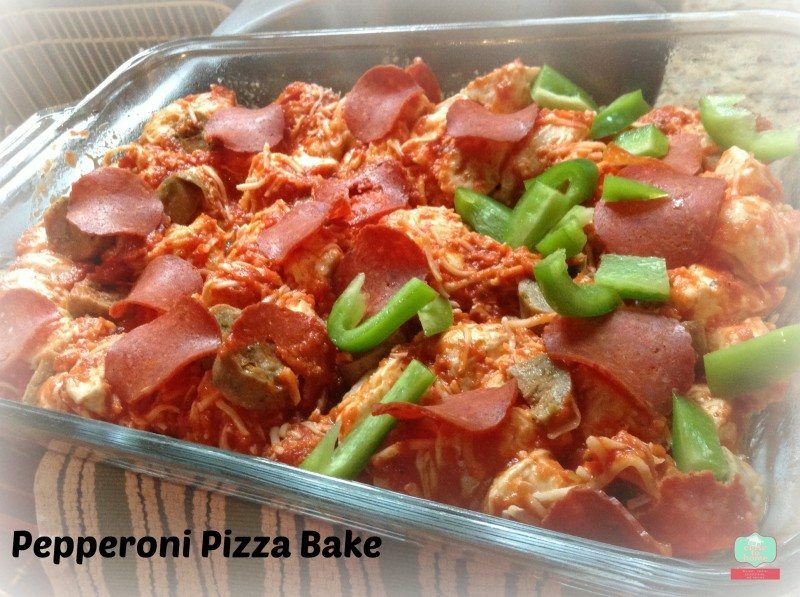 Pepperoni Pizza Bake. I was more impressed by the ease of preparation and how much we really enjoyed this dinner, which took 40 minutes max, 25 of that in the oven and 5-10 cooling down before eating. Which leads to 10 mins of prep time. Talk about an easy dinner idea. In the time you would order out for pizza you have dinner on the table. First you cut each of the Grands Biscuits into 8 pieces. I found it easy to pile them 3 high for efficiency. Mix together the sauce and cheese. 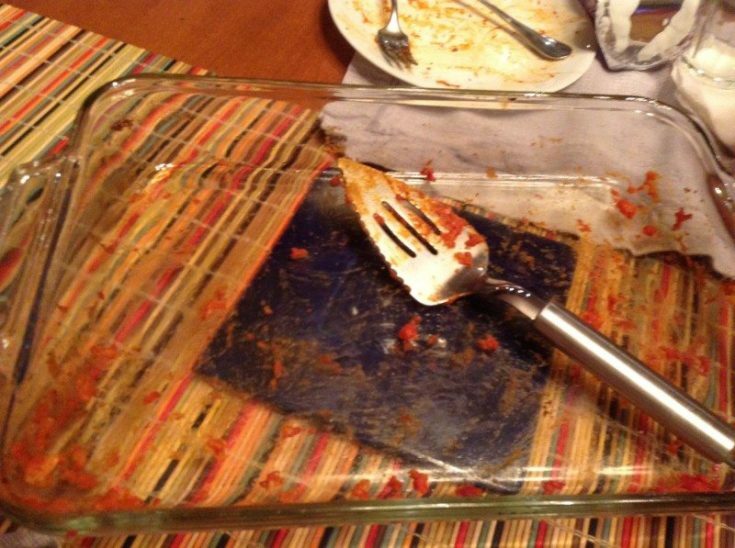 Layer it in a glass casserole pan. Top it with any pizza flavors your family would enjoy. I added turkey pepperoni, fully cooked chicken italian sausage and half of the casserole had green peppers. 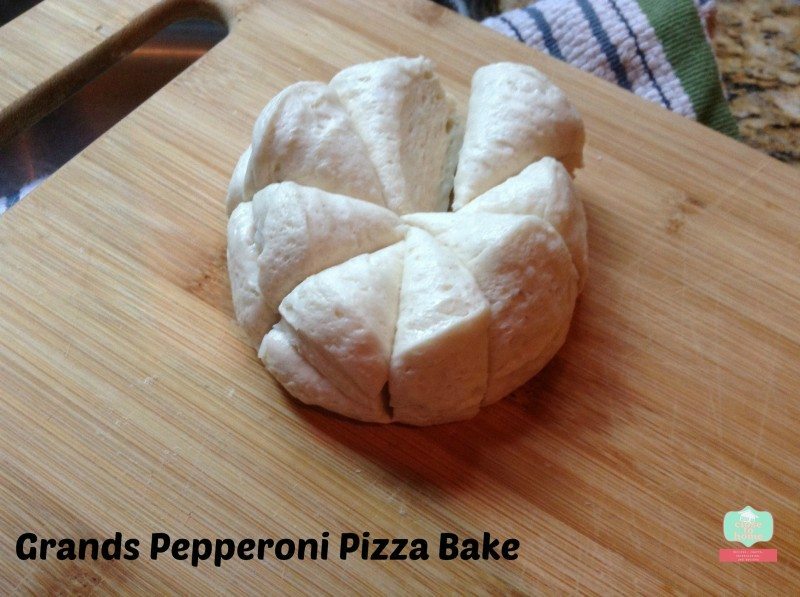 Just like a pizza shop you can customize this recipe to meet your family needs. Bake and allow to sit a few minutes. Does this give any indication about what my family thought of this meal? 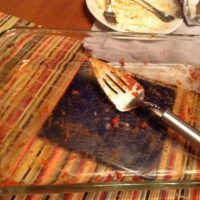 Here is what my family thought of this meal. Even though you are tempted to go to the drive thru or serve the kids cereal, (nothing wrong with either of those) be sure and check out the Pillsbury Recipe guide to Back to School Easy Dinner Ideas, you will be pleasantly surprised. This was so easy I am sure my kids could have easily made it. I am going to make the Pot pie cups next. SPREAD in sprayed 13x9-inch (3-quart) glass baking dish. 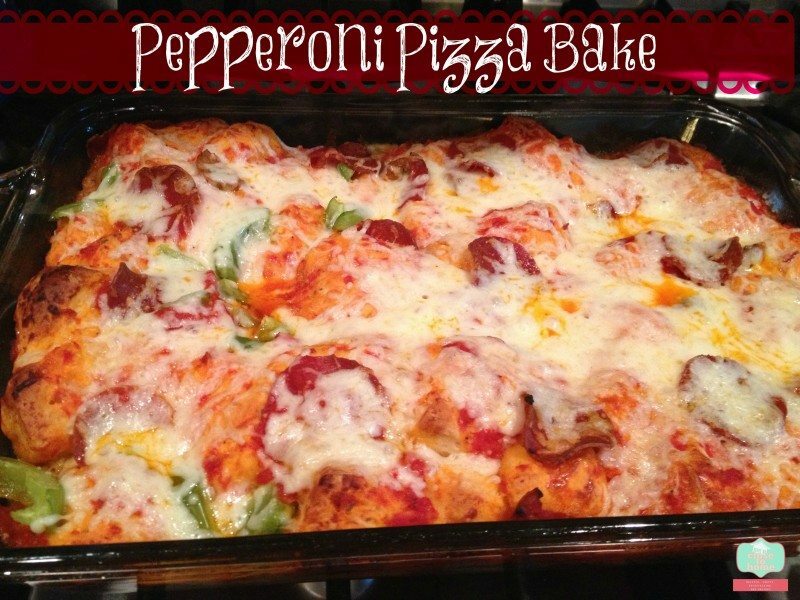 Top with pepperoni and peppers if using. BAKE at 375°F 20 minutes or until golden brown and bubbly. Add remaining cheese and allow to cook another 5 minutes or until cheese melted. What is you favorite go to quick meal idea? thanks I will come by and pin this too. Hi Maria, this sounds like a great quick and easy recipe to make for a busy week night dinner. I pinned it and thanks for sharing. Totally pinning this. We may even eat it for dinner tonight! Thank you for coming by. 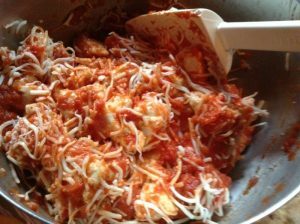 YOu do have a long day this is the perfect recipe that you can do any weeknight without really thinking about cooking. I always have some Pillsbury biscuits in the fridge. This looks like something my girls would love to have for dinner! Thanks for sharing! We use those biscuits for a lot of our muffin tin dinners. I’ve never cut them up and made a casserole with them before! What a great idea. Will definitely try this–I know my kids will love it. That does look like a quick and easy pizza! I am interested to see what the pot pie entails and if it can be made for just me! Hope you enjoy it. I was pleasantly surprised by the reaction from everyone including myself..
Wow! That looks so good, and so quick and easy! Definitely a go-to dish for a school night! Thanks for the recipe! I cannot wait to give it a try! What an awesome (and easy enough!) dinner idea now that school and sports and other activities are back in session. I could definitely use that booklet of simple recipes. I’m always looking for ideas! I love using pillsbury. I am going to make this for my kids. Thank you for the recipe.